31st July 2011 - Who's made a mark this week? In June I greatly enjoyed posting a photo to this blog each day to show you a bit of Provence. To my great surprise this turned out to be very popular! So much so that I've decided to progress an idea I've had on the back burner for a while. I'll be writing more about it in a little while but suffice to say Makingamark - The Daily Photo - starts up tomorrow [Update: This is the first post -A is for Aeonium arboreum 'Atropurpurerum']. The basic idea is explained below and at greater length in a text box on the blog. The Daily Photo is about creating pictures rather than photography per se. It's all about the process of creating a personal visual identity. My photographs are from the past and the present - from here and there - in the UK and abroad. These photos reflect what particularly interests me - such as important elements of design like shape, colour and texture. Landscapes, flowers, plants and markets are also an abiding interest. It's essentially image focused with just a few words by way of explanation where relevant. If you think you might be interested there are all the usual ways to sign up and subscribe. Posted by Making A Mark on Sunday, July 31, 2011 8 comments Who's linking to this post? Categories art news, who's made a mark this week? Only 44% of those responding to the July Making A Mark Poll spend an affordable sum on art societies. This post looks at the overall poll results, considers what these might mean and asks three questions about how art societies can become more cost-effective. The results of the poll are charted below. 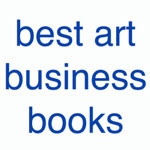 The original post outlines some of the reasons for asking this question POLL: How much do you spend on Art Societies? Posted by Making A Mark on Saturday, July 30, 2011 2 comments Who's linking to this post? The Cornwall Big Paint In - on a beach! 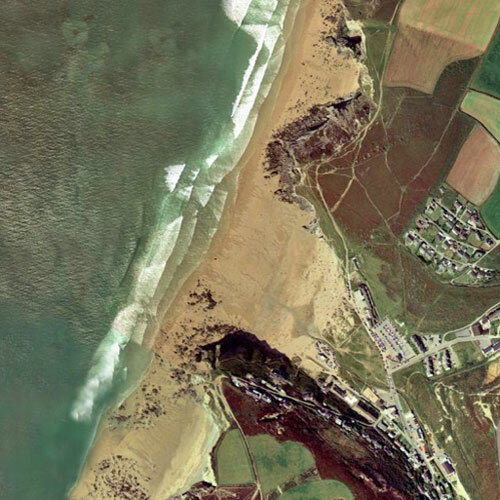 On 13th August, a lot of plein air painters are planning to be painting on a beach in Cornwall. Painter Paul Wadsworth was minding his own business and painting with a small group on a local beach in Cornwall when he was challenged as to whether he had permission to paint on the beach! He was told he would need to write to a local committee to get permission. The rationale used was that if everyone wanted to paint on a beach where would that leave everybody else? Chaos? I'm assuming the individual concerned had not heard of the concept of public open space and public rights of way/access! reinforce the view that you can gather in a public open space for social interaction - just like families and friends do when they come down to a beach and set up various bits of kits for their personal enjoyment. The other reason for doing it is to try and create an amazing day for plein air painters and a chance of like minded artistic souls to gather and create in Cornwall! The paint-in will be followed by a BBQ - so it's suggested those wanting to attend should also bring food, wine and musical instruments. Thought is being given to creating an exhibition from the event and to also making it an annual event - depending on the response on 13th August. Posted by Making A Mark on Thursday, July 28, 2011 6 comments Who's linking to this post? The Outwin Boochever Portrait Competition 2013 is an art competition which believes in planning ahead. The call for entries runs from September 1, 2011 and October 31, 2011. 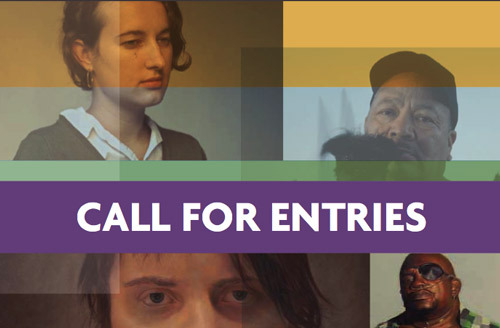 The competition and resulting exhibition will celebrate excellence and innovation, with a strong focus on the variety of portrait media used by artists today. Posted by Making A Mark on Wednesday, July 27, 2011 0 comments Who's linking to this post? The Daily Paintworks website has had a radical overhaul and is now pursuing a completely different business model. This post reviews what has changed and the features and benefits on offer to those wanting to sell their art online. Future updates will be posted to my Making A Mark Reviews blog. The daily painting model has been around for a while now. Last week I did a recap of how approaches to selling work developed and became refined over the course of the last five years or so since I started following people doing daily paintings - see A Timeline of Daily Painting Practices and Marketing. It's very clear that there are an awful lot of artists who still get enormous value from painting every day or most days - and who still want to sell their paintings. However over time, it's become clear that most dedicated artists, while painting most days, are not attempting to produce a new painting each day. and/or are just more realistic about what is a sustainable practice on a long term basis. and/or artists realise that they need to stay focused on the process rather than fixating on the generation of the product. However there continue to be very many artists producing small works for selling online who are producing artwork in a regular way to a consistent standard. However most of those artists are still in need of an effective method of raising the profile of their work. The biggest challenge is still getting the customer to view the artwork - which is where sites which help out in this respect come in. It's also one of the reasons why Daily Paintworks has changed its approach. 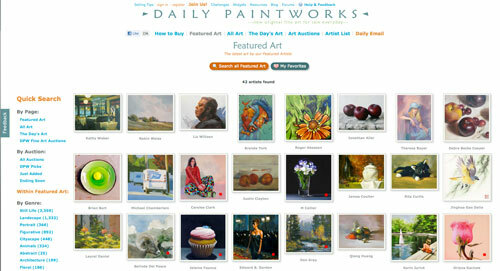 The Daily Paintworks site started in December 2005 (see Daily painters, paintings and paintworks - and where you can see them 05 Dec 2007). It was started by Carol Marine (Carol Marine's Painting A Day) with assistance from her husband David who is a "daily programmer" and who set up the website. Daily Paintworks started as a small exclusive group of painters who wanted to have a co-operative approach to marketing their artwork. The idea was that they should have a website which provided an online gallery. This would then enable them to pool funds so that they could fund some advertising. It was a great idea and I gather proved to be very effective for a number of the artists. The group started as eight artists and then increased to twelve artists - with membership changing over time. Each member needed to provide a not insignificant subscription which generated the funds for advertising and other expenses. The DPW website then remained unchanged for three years. Last summer, in Carol and David's view both the site and traffic was beginning to stagnate and needed to be re-energised. The group of artists were very much focused on painting. Much less effort had gone into thinking through how to improve the marketing side and this needed to be addressed. achieve a sustainable business model for the benefit of all participants. Posted by Making A Mark on Tuesday, July 26, 2011 2 comments Who's linking to this post? 24th July 2011 - Who's made a mark this week? Yesterday's post (Techie: How NOT to lose all your Blogger Pics!) was rather important and I wanted to leave it up in people's blogrolls for a bit longer. I cannot imagine anything worse than losing all the images on my blog! Thanks to all those who are sharing the information around with bloggers reading their blogs. I've been amazed since I first posted it how many people do not realise that all their Blogger pics are in Picasa albums - and more to the point how some people claim that they have got photos in their Picasa albums which they say they've not uploaded to the Internet!! I ran out of steam! I realised the problem is that now I'm back I'm reading back over several weeks of great posts and trying to squeeze them all in - which isn't possible. So this is a bit of an odd edition of "who's made a mark this week?" Posted by Making A Mark on Sunday, July 24, 2011 2 comments Who's linking to this post? Categories art news, art society, exhibition, Google, internet tools, Lucian Freud, sketch, sketching, tips and techniques, webware, who's made a mark this week? Techie: How NOT to lose all your Blogger Pics! First, this is a salutary tale of how to avoid losing all your pics from your blog(s) when moving to Google +. avoid people downloading your images from Picasa web albums and making prints of your artwork. Finally, where to go to get the Picasa software so you can edit your pics. 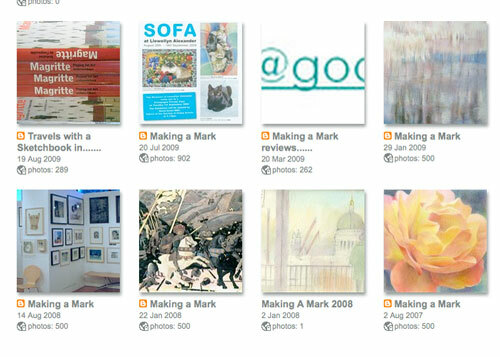 Posted by Making A Mark on Saturday, July 23, 2011 21 comments Who's linking to this post? 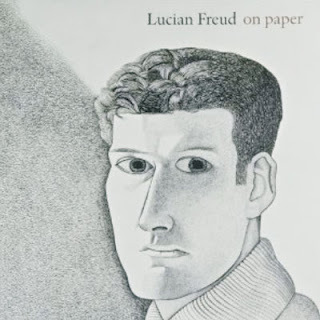 The self-portrait on the cover of "Lucian Freud - on Paper"
"Britain's greatest living painter" has died. Lucian Freud OM, CH - regarded by many as the UK's best figurative painter and portrait artist - died peacefully in his own home in London on Wednesday night age 88. Born in Berlin, Germany in 1922, he had been painting for over 70 years. In 1933 he moved to London with his family to escape the Nazis. His artwork showed early promise and he had his first one man show in 1944. His latest exhibition was at the Pompidou Centre in 2010. Given his great age, he has already had a number of retrospective exhibitions. I think we can be assured that the planning for another one will be getting underway in the near future. Posted by Making A Mark on Friday, July 22, 2011 4 comments Who's linking to this post? 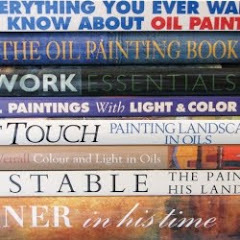 What follows is a record of the blog posts I've written on this blog in the last five years about the daily painting phenomena and how it has developed - both in terms of painting practice and marketing practices. 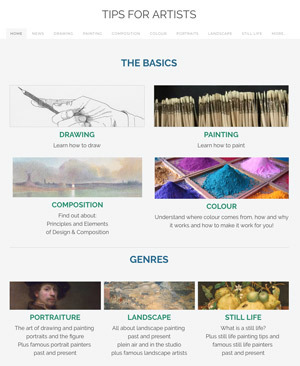 I started compiling it because I'm drafting a blog post about the Daily Paintworks website and its brand new approach to marketing art online. It seemed like a good idea to start by getting a fix on what has happened when in the timeline of developments in the marketing of daily paintings. It soon became apparent that this topic deserves a post all to itself rather a footnote! For those who are new to the notion of selling your art online, the posts provide an insight into the history of what has gone before. I've split the posts into two halves. .
Posted by Making A Mark on Thursday, July 21, 2011 0 comments Who's linking to this post? Your Paintings" is one of the most remarkable digital art projects I've ever seen online. The aim is to catalogue and display the entire national collection of oil paintings in the UK online on a dedicated website! 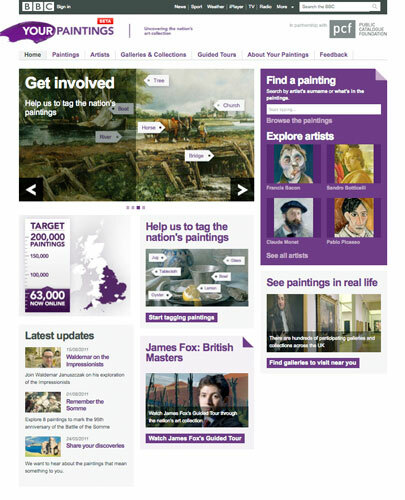 Your Paintings is a joint initiative between the BBC, the Public Catalogue Foundation (a registered charity) and participating collections and museums from across the UK. 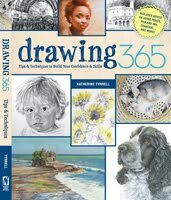 It's going to be a fantastic learning resource and will be of particular interest to artists and those involved in art education - art students, art teachers and home schoolers. Importantly, it also extends the concept of what public access to our artistic heritage should be about. The project focuses on all the oil paintings in public ownership - so my brand new efforts at oil painting won't be making the cut. However it's not just paintings in art galleries and museums as this video shows. The paintings are drawn from public collections in every part of the country, big and small, from the most famous to the completely unknown. They include the UK's national museums and galleries, regional collections, the National Trust, as well as the less obvious public collection like those in universities, council buildings, hospitals and fire stations. how you can get personally involved - and help by tagging the nation's oil paintings! Posted by Making A Mark on Wednesday, July 20, 2011 0 comments Who's linking to this post? The Colored Pencil Society of America held its annual convention in Dallas last week. 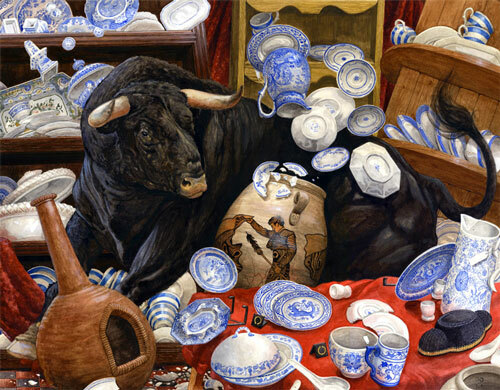 The artists who were chosen as prizwinners at CPSA's 2011 Annual Exhibition were announced at the dinner on the Friday night. The top prizes were awarded to the artists detailed below. I've included links to their websites so you can see more of their artwork. Posted by Making A Mark on Monday, July 18, 2011 1 comments Who's linking to this post? Those of you interested in drawing - and the variety of ways in which drawing can be pursued - will no doubt be interested in which artists have been selected for the Sherwood Drawing Prize 2011 exhibition. The Jerwood Drawing Prize is the largest and longest running annual open exhibition for drawing in the UK. Judged by an independent panel of selectors, the Prize aims to recognise and support all UK based artists, from student to established, working in the field of drawing. Below you can find the names of the 60 artists selected for the Jerwood Drawing Prize 2011 are listed below. Plus the hyperlinks within their names are to their own websites. Links to the right of their name are to related sites. I've selected websites based on content. Robert Battams - check out his handcut sketchbooks. There's more than one way of drawing in a sketchbook! Posted by Making A Mark on Monday, July 18, 2011 0 comments Who's linking to this post? 17th July 2011 - Who's made a mark recently? A slight change in the post title to reflect that this is the first "Who's made a mark?" since 29th May! It's been a long time. I've had a splendid holiday but also needed a bit of a rest from the journey back. Now I'm on catch-up. I've been lobbing items into this post over the past few weeks so some are a little old. In the near future, I'm also going to playing catch-up with exhibitions in London - notably the Royal Academy Summer Exhibition and the BP Portrait Prize. 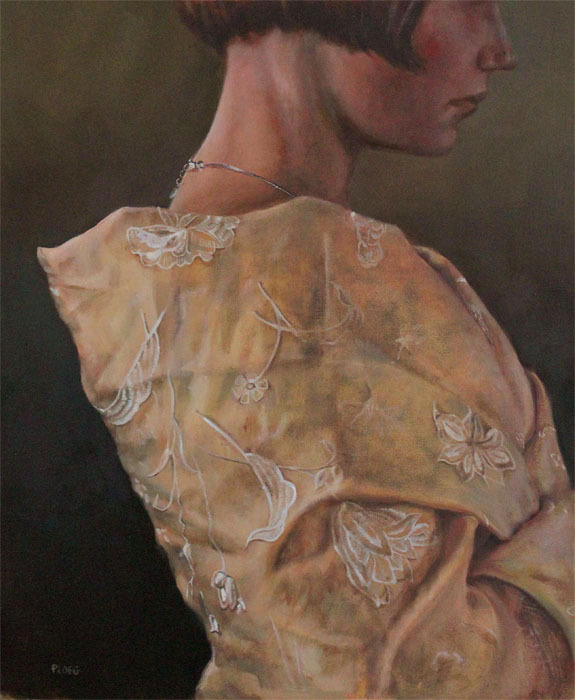 Congratulations to Sophie Ploeg (Sophie Ploeg) whose painting Yellow Scarf features at the top of this post and won the Winsor and Newton Choice award at the Society of Women Artists 150th Exhibition. It forms part of a series of paintings about fabrics which you can see on her website. Richard Bell of Wild West Yorkshire who has been to Switzerland. Meanwhile people attending Drawn to Lisbon - Urban Sketchers Symposium (July 21-23) are beginning to assemble in or near Lisbon. This is the symposium blog which includes posts from those taking sessions. You wouldn't believe the number of people who have been posting about their sketching gear preparations for Lisbon! Here's some of them. Pete Scully (Peter Scully) photographed his art kit in tomorrow never knows. The same photo on Flickr is rather better as he's itemised every part of his kit! I was sent a link this week - for which many thanks - with the suggestion it was worth highlighting. 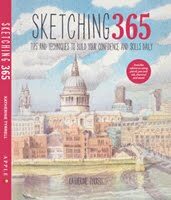 It's about a new book Think Inside the Sketchbook by Gillian Robinson, Alison Mountain and David Hulston. A fascinating post by James Gurney (Gurney Journey) about a distant relative and what Howard Pyle, the American illustrator and writer, had to say about composition - see A Pyle student named Gurney. Did you know there is a blog devoted to Howard Pyle? 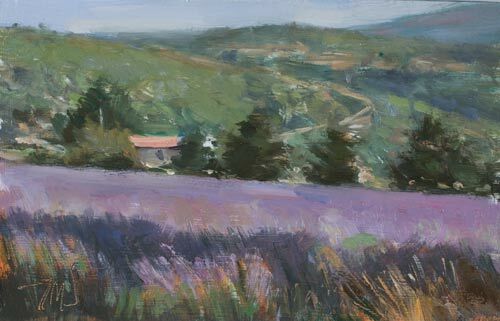 Plein air painters in the UK have formed a Plein Air Brotherhood. They've got a website and a Twitter account - now all the need is a blog! Julian is back posting on Postcard from Provence - however last week he was posting from the bar in town as it appears the internet woes continue. (I think I still have the wifi access code in my handbag!) See the splendid still life paintings (lemon and blue bottle, apples and confit pot and peaches, bottle and copper mould) he's been working on - plus he was also painting the lavender near to Sault last week ! I've still not mastered the colour of lavender so asked him what he used. I used a micheal harding bright pink lake (which is a mixture) with ultramarine blue, permanent alizaron and some burnt sienna and possibly a little ochre with titanium white. The Lavender can be very gray or very pink purple depending on where you are positioned in relationship to the sun. Have you come across the 100 Washes Challenge Blog yet? It started in October 2010 but I've only just discovered it and it seems like a great idea. Participating artists (some of whom are not regular bloggers) are Theresa Evans (Landscape and Nature Paintings) Maggie Latham (Maggie Latham Art); Christy Lemp (Watercolor wanderings) Suzanne Lindfield (Herborium); Vanda Massey (Vanda Massey); Jane Minter (Jane Minter) and Olivia Quintin (Olivia Quintin). What is it with art crime - it seems to be everywhere! My jaw dropped recently when I began to appreciate the way the Wildenstein family operated in relation to the designation of a Monet - in defiance of academic opinion. It dropped still further this week when I read that Guy Wildenstein, the billionaire Franco-American art dealer, had been arrested in Paris and accused of fraud. See Billionaire dealer accused of fraud over missing art. Wildenstein, Murdoch - which of "the untouchables" is next? Note: I went looking for a website link for Guy Wildenstein and ended up with wikipedia - which has been "hacked" with a vengeance! Do take a read before somebody corrects it - click the link in Wildenstein's name! More jaw-dropping stuff - The stolen Turners, the Serbian underworld, and a £24m insurance job According to the Independent this is the Tate's extraordinary coup in securing both a massive payout and the return of the masterpieces can be told at last. Art Collecting - which looks like it might be a useful site - has an eminently sensible post about The Importance of Documenting your Art Collection. Jonathan Jones asks Are we a nation of abstract art snobs? and why people in Britain have such a different attitude to abstract art compared to Americans. the BP Portrait Prize - I missed going to the PV for the announcement of the BP Portrait Prize while I was on holiday but will be doing a proper catch-up about the BP Portrait Prize shortly - once I've had an opportunity to see it. In the meantime here's some posts about Wim Heldens win and the impact on those rejected for the exhibition. the Jolomo Scottish Landscape Painting Prize - see my post over on The Art of the Landscape -Scottish Landscape Painting and a £25,000 prize. I hadn't come across this before - but that first prize is hefty!! the Northern Art Prize 2011 has announced the artists shortlisted for the £16,500 First Prize. The winner will be announced in January 2012. You can also see the artists longlisted on the website - and who they were norminated by. 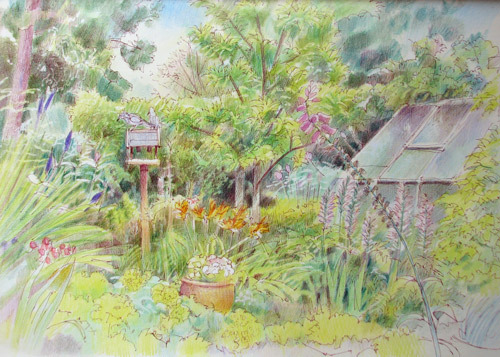 the Sunday Times Watercolour Competition - Artists selected were announced last week. Some artists who entered the art competition for the Sunday Times watercolour exhibition have been less than impressed by the Panel's decision to choose a third fewer paintings than the number advertised in the prospectus. At least one is asking for her money back and there's a prospect that it have implications for next year's entry. See 2011 Sunday Times Watercolour Competition - selected artists and in particular the comments. I'm thinking about doing a blog post about the how both parties need to satisfy the conditions of art competitions and would be interested to hear your views - leave a comment on the post. In London, the antitthesis of the art competition - the CGP London Open Exhibition, a leader in the field of the uncurated "hang the lot" art exhibition since 1984, will be holding its annual exhibition at the Cafe Gallery shortly. Meanwhile in the Guardian, Jonathan Jones wrote an article titled Rise of the prize: are juries taking over the arts? which asked whether arts prizes and their judges should be allowed to shape our cultural landscape? Charley Parker (Lines and Colors) has highlighted a new exhibition about Rembrandt and Degas. Further details of the exhibition can be found at For the first time: Rembrandt & Degas, Rijksmuseum to 23 October 2011. One for the calendar - I missed highlighting a major new open exhibition for fine art printmakers - whose receiving days were this week. BITE is to be a new contemporary printmaking show in London, showcasing the most exciting prints by artists working in a range of different printmaking methods. The exhibition will open at the Mall Galleries on Wednesday 24 August and closes Saturday 3 September. I had to miss going to the private view of the Royal Academy Summer Exhibition due to holiday preparation priorities. It opened on 7th June and will close on 15th August. I won't be taking "he must not be bored while I sketch" - as he's found it very boring in the past! The Guild of Aviation Artists: ‘Aviation Paintings of the Year’ Annual Summer Exhibition opens at the Mall Galleries on 19th July and runs until 24th July. This month's Making A Mark Poll is about POLL: How much do you spend on Art Societies? The Royal Society of Portrait Painters has a brand new website - see http://www.therp.co.uk/. As with all new designs there are a few tweaks required. 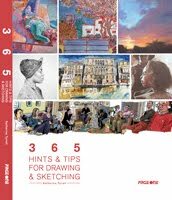 I'm looking forward to doing a review of it and highlighting the lessons which can be shared with other art societies in the near future. For example it includes several new features which are very customer-oriented in relation to sponsorship and those wanting to commission portraits. It's also nice to see a society boasting about its visitor numbers too - which is so very helpful to artists trying to decide whether they should enter open exhibitions. Two posts this week about the current surfeit of programmes about art on the BBC. Could it be that "the silly season" now needs to be rechristened "the art history season"
The latest Art on the BBC - about three programmes concerning British masters of the twentieth century; fake paintings and forgeries, art deco icons and another chance to see the programme about the story of British landscape painting. Watch out for a major post new week about another new development next week. 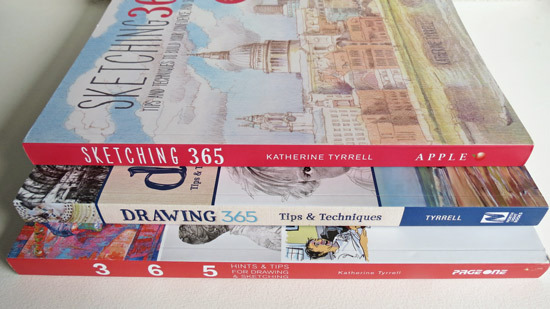 The Princes Drawing School now has a blog - see The Prince's Drawing School Blog. They also have free taster sessions available for new autumn classes. his panel boxes for carrying plein air painting boards. Lots of images and lots of tips if you want to make your own as he has done. Anybody care to recommend a lightweight version that works well in the field? Have you seen the Daniel Smith article about granulating watercolour paints? The Clustrmaps blog announced that they are now producing tweet maps! I like Clustrmaps - it provides me with a very quick and simple way of understanding where my posts get read. I vividly remember walking through Tate Britain once and coming across Mark Wallinger's reconstruction of the Brian Haw protest about the Iraq War in Parliament Square - which included the line on the floor to represent the one kilometre from Parliament inside no demonstrations were permitted. The line bisected the "protest" exhibition. Was this Wallinger, Haw and the Tate thumbing their respective noses at Parliament? (Do Museums have noses?!) Was this installation art which finally had some real meaning? "Brian Haw, the father of seven, anti-war loony who used to bellow at me on my bicycle . . . I thought his posters and general gubbins were a disgrace and spoiled the look of the place; and yet he . . . represented something dementedly British . . . Across the world, Britain still stands for a certain idea of liberty, a particular concept of the relationship between the citizen and the state." Posted by Making A Mark on Sunday, July 17, 2011 8 comments Who's linking to this post? Categories art, art blogs, Art Business and Marketing, art competition, art crime, Art Galleries and Museums, art news, art society, drawing, exhibition, painting, sketching, who's made a mark this week? and I had. In fact I'd missed out TWO! 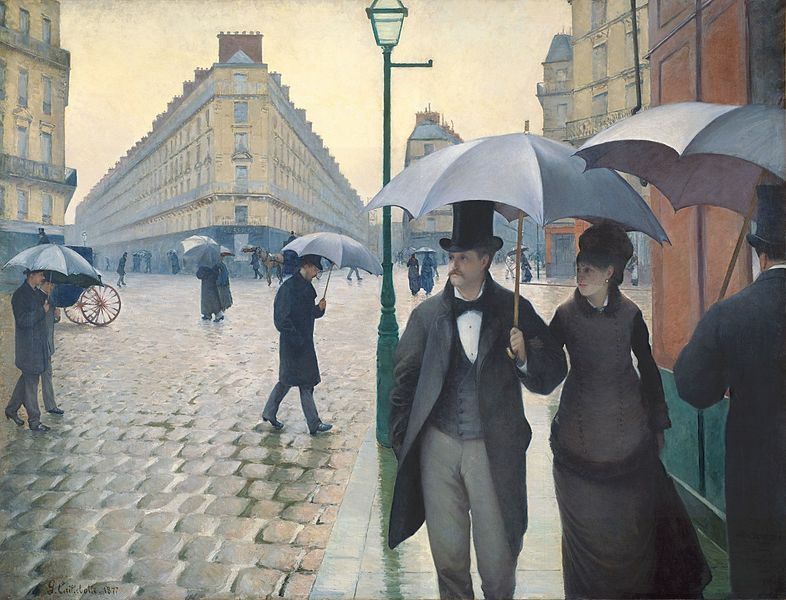 The point is, we who think we know everything about impressionism know very little. Impressionism cannot be boring because nothing concrete enough is known about it yet to be bored with. What does exist — and this is the real enemy — is an utterly misleading set of preconceptions. They exist. And they need to be challenged. In the first episode, Waldemar delves into the back stories of four of the most influential Impressionists - Pissarro, Monet, Renoir and Bazille - who together laid the foundations of the artistic movement. He finds out what social and cultural influences drove them to their style of painting, how they were united and how ultimately they challenged and changed art forever. Posted by Making A Mark on Saturday, July 16, 2011 7 comments Who's linking to this post? 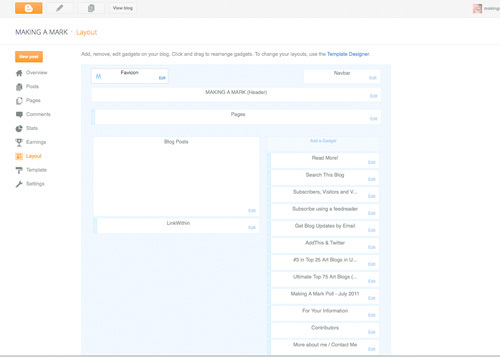 Blogger has a new interface - very minimal and very clean. It reminds me a bit of Apple. I'm still working my way through it. So far as I can see all the rest of the "behind the scenes" stuff is pretty much the same as before - but it sure looks very different! Very Zen! In some ways it's quite disconcerting and I recommend that you don't take a look until you've got time to explore slowly. Otherwise you might just get lost! The way to access the new interface is via Blogger in Draft - which is the part of Blogger where you can try out the new developments before they are released to the world in general. Blogger’s Updated Interface Now Available for All Draft Users (7 July 2011) which highlights how the new design is now available to all Draft Blogger uses - which includes me. This page lists known issues and the ones which have been fixed. What I like best - the fact that the window in which you post now extends as you write so you can see the whole post on your screen all the time. About time too! Major gripes - it would seem that I am not alone in finding it hard to look at in terms of brightness and lack of contrast for those of whose eyesight is less than wonderful. I think Blogger needs a user panel which includes older people! Comments about how it's working can be found and where things can be found - can be found in comments! You can also read the comments on the Blogger in Draft posts to see what else people like/find irritating. Posted by Making A Mark on Friday, July 15, 2011 10 comments Who's linking to this post? 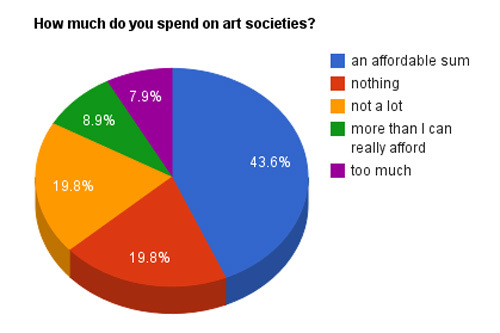 POLL: How much do you spend on Art Societies? 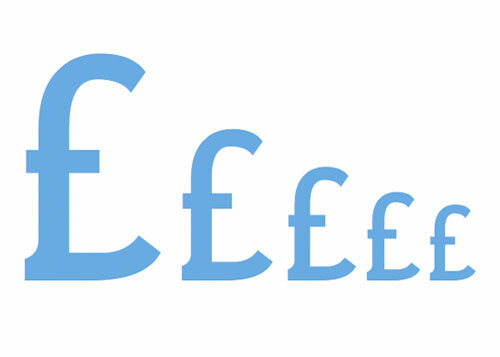 How much do you spend on Art Societies in terms of annual membership fees and entrance fees for exhibitions? Last month we looked at how many art societies you belonged to and this month the July Making A Mark Poll is about artists' spending on art societies - and the extent to which it feels like an affordable sum for you. Posted by Making A Mark on Thursday, July 14, 2011 0 comments Who's linking to this post? 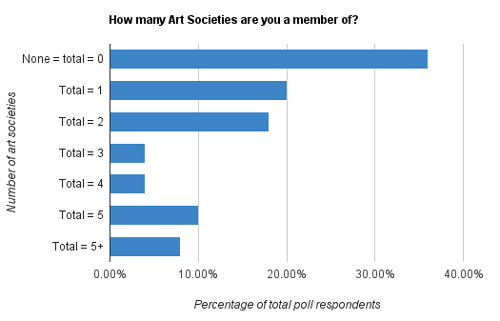 The chart below shows how people responded in terms of the number of art societies they belonged to. This is followed by more charts showing membership at the national, regional and local levels. Posted by Making A Mark on Wednesday, July 13, 2011 0 comments Who's linking to this post? I've returned from Provence and collecting my cats to a surfeit of art programmes on the BBC. Here's a round-up. This brand new series started on BBC4 last night and comprises three programmes by art historian James Fox. The programmes were made to support his theory that British Painting between 1910 and 1975 ranks alongside the Golden Ages of Renaissance Italy and Impressionist France. We Are Making a New World - last night's edition - focused on the following painters and the ways in which they remade painting in the twentieth century to reflect a new world and a break with traditional ways of painting. The notion proposed is that somehow painting became more British as the British empire slipped away and Britain became less important in the world. This first programme focused on a generation of artists most of whom studied under Henry Tonks at the Slade. Posted by Making A Mark on Tuesday, July 12, 2011 3 comments Who's linking to this post? 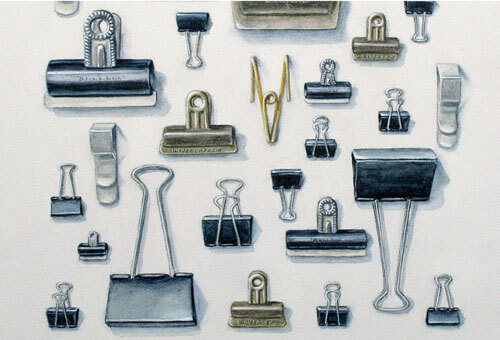 The names of the artists - and the number of their works - selected for the 2011 Sunday Times Watercolour Competition exhibition at the Mall Galleries in September can be found below. The competition has a first prize of £10,000, In total, some £18,000 in prize money is awarded to artists who demonstrate a high level of skill and creativity in the opinion of the judging panel (see Sunday Times Watercolour Competition - Call for Entries). Below, on the left, is the list as published by Parker Harris yesterday and on the right are the links to websites that I've found to date. If anybody spots a person they know and/or a website attribution which needs to be included/amended please let me know via a comment on this post. Details about the exhibition can be found at the end of the post along with links to some of the previous posts on this blog about this exhibition. Tessa Shedley Jordan: 238 Tessa Shedley Jordan's webpage on Hunter Gallery website. I've seen her work before and it is extremely impressive. I'm only surprised she's not already a member of one of the two national watercolour societies. ‘My distinctive style is achieved via a highly individual painting technique. Combining cold water dyes with wax resist to create bold statements of texture, mood and light. I've not got the list of full names as yet (but it's coming!) so I'm having a bit of difficulty finding their websites for you to see the standard of their work. Consequently this post will be updated when I have the full information. 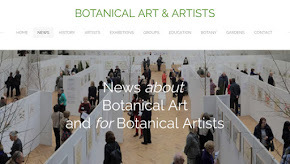 However what I have detected so far is that a large proportion of those selected are NOT members of the two national watercolour societies - the Royal Institute of Painters in Watercolour and the Royal Watercolour Society. Now that of course could be because members did not enter the competition! 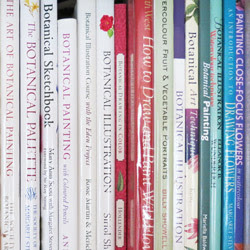 The list also includes watercolourists who belong to other art societies. 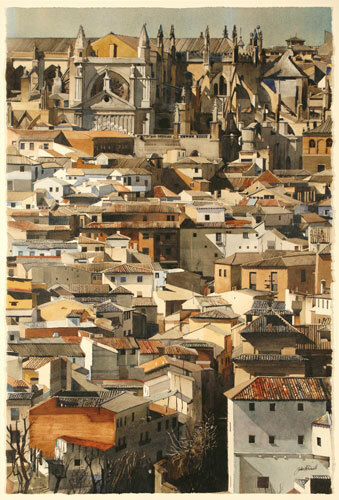 The 2011 Sunday Times Watercolour Exhibition is held at the Mall Galleries between 12 - 18 September 2011. The exhibition is open from 10am - 5pm daily and admission is free to all. PS Yes folks - I'm back blogging about art and not Provence! This is for a couple of days only as I'm not back properly to art blogging until next week. Once I've got over three days of driving (I need a walk!) I've got to drive north to collect the cats from their holiday and give lots of lavender to my mother! Posted by Making A Mark on Tuesday, July 05, 2011 9 comments Who's linking to this post? Champagne vineyards near Epernay, France, a photo by makingamark2 on Flickr. These are the champagne vineyards approximately 100 feet to the right of where I'm sat right now just north of the town of Epernay which plays host to the HQ of some of the major champagne houses. Posted by Making A Mark on Monday, July 04, 2011 0 comments Who's linking to this post? Sunflower, a photo by makingamark2 on Flickr. Yesterday, while taking my satnav divert away from the Autoroute de Soleil - while the whole of France hit the road as the schools finished for the summer - I saw a number of delights travelling along the D roads. First came the endless vineyards of the Rhone valley as I travelled up the D7 and D8. Then the fields of sunflowers started. Huge fields completely filled with sunflowers in full bloom. I don't think I've ever seen them looking so fresh. It was like the impact of trees in fresh leaf after a long winter. Later I had to get back on the autoroute again and discovered that if you love looking at sunflowers the fields south of Bourg-en-Bresse are full of them. Field after massive field of sunflowers - they were simply stunning - but no photos as I was driving! The next photo is likely to be of the Cote d'Or where I'm going for lunch at Gevrey Chambertin. Posted by Making A Mark on Sunday, July 03, 2011 2 comments Who's linking to this post? Dentelles de Montmirail - sunset, a photo by makingamark2 on Flickr. I started with a sunrise over Mont Ventoux - http://makingamark.blogspot.com/2011/06/sunrise-over-mont-ventoux.html - so I thought I'd make the photo posted on my last morning in Provence a sunset. This is the sunset I enjoyed while sat eating my dinner at Le Mas de Vignes on Thursday night. The view is of the Dentelles de Montmirail. That's "Dentelles" as in lace not teeth! You can find more images from Provence in two sets on Flickr of my photos uploaded to date - see http://www.flickr.com/photos/makingamark/sets/72157626821204323/ and my sketches - see http://www.flickr.com/photos/makingamark/sets/72157627095818732/ . However there's a lot more to be uploaded when I get home! Posted by Making A Mark on Saturday, July 02, 2011 3 comments Who's linking to this post? Pantiles and roof stones in Provence, a photo by makingamark2 on Flickr. In Provence you frequently see very large stones (small rocks) sitting on top of the clay pantiles. These help to weight the roof down. You have to experience the very fierce winds which can blow here to know why this seems a very sensible idea. Posted by Making A Mark on Friday, July 01, 2011 3 comments Who's linking to this post?